I'd love to know who else feels the need to put their HP books and all things HP-related on their own, separate bookshelf! Even when I only owned the box set of books 1-4, it had a shelf all to itself, even though I had to get creative with organizing the rest of my books into the remaining space, lol. I can't just lump HP in with the rest of my books, as precious as those are to me, too, because it's Harry Potter. Your HP shelf sounds sweeeeet! I'd love to see a pic of it one day! :D I'd love to add a mini cauldron to my HP shelf; that would be SO perfect! Haha, nice! I completely understand. My shelves are divided by cubbies that are about a foot long each, so HP has a cubby to itself. I have doubled-up other cubbies to fit all the books, but not my Harry Potter books! 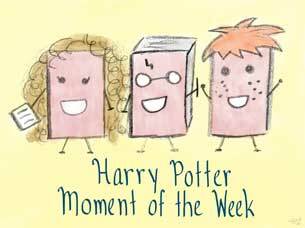 This week I wrote about the moment of the books that made me laugh more than any other...feel free to check it out HERE. 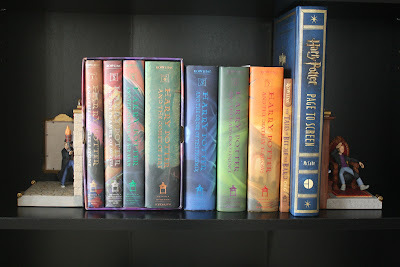 Yay- it makes me happy that I'm not the only one who gives the HP books their own space! Even if I ran out of shelves for the rest of my books, HP would still have its own shelf, lol. I love your shelf and am so JEALOUS you have the Page to Screen book! I've had my eye on it for so long but just haven't ever gotten it. I think it was like $50 the last time I saw it Costco? And I'm still justifying paying that much for a book when I can use that $50 to get maybe two or three other books. But anyway, I love your shelf! :) One can never have too much Harry Potter. I paid about $50 for my copy of Page to Screen, and the price made me wince a little, too. But, I HAD to have it, and it's a beautifully assembled book. The pages are printed on glossy paper, which makes all of the photos in it look even more amazing. I've always wanted to try organizing books by color, too. The photos I've seen of shelves like that are so pretty, but I also couldn't bear to separate any series! I've had them for about 10 years now, and they're easily my favorite HP-related items I own. 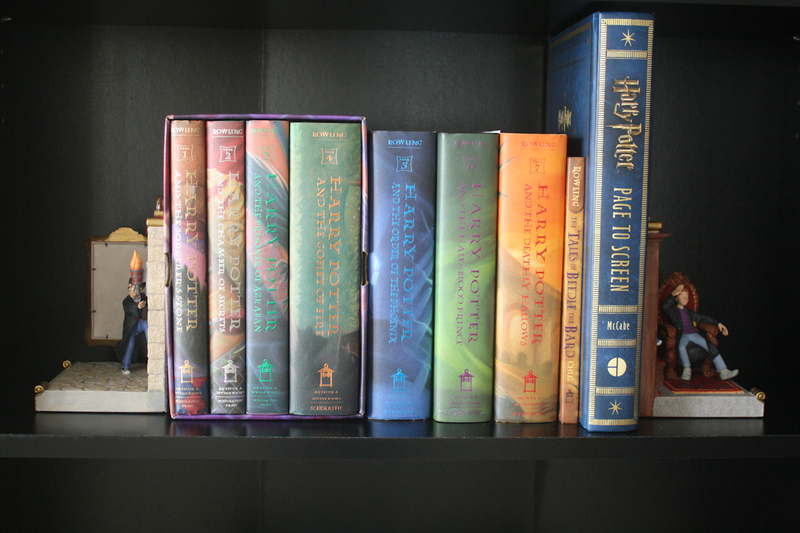 If I ever found more HP bookends, they would definitely be going home with me! Awwe I love the book ends! I don't have HP on it's own shelf. Oddly enough, I ended up with two copies of some of them. I think someone must have borrowed them and I didn't feel like waiting to get them back. I have them on a shelf with the Percy Jackson series and a Slytherin chocolate frog card, a Hagrid figurine, a Mad Eye figurine, and a glasses frame with pics of Zane and I at Harry Potter World. Have a wonderful weekend :D Jaclyn @ JC's Book Haven. I love the bookends, they are so adorably cute. And wow, a whole shelf, I wish I had that luxury, although I need more Harry Potter books to make a shelf I think if I am honest.